Since it’s near the back of the scene, I didn’t need to worry about doing an interior. Therefore, for the four walls I stained scale wood of various widths, chopped a bunch to length, and laminated the strips over black styrene sheet. I braced the finished walls with more styrene inside. Four styrene panels formed a sub roof. I framed these with wood strips to simulate the boards under the roof covering. I don’t have a good picture of the roof of this structure, but I decided a corrugated roof would look nice – and I had a package of corrugated metal from Builders In Scale in stock (Part 839, if you’re interested). I cut this into 26″ wide strips as recommended in the directions, and glued the panels in place with thick CA. The weathering was applied later – using weathering powders to create that rusted out look that are de rigeur on old corrugated roofs. Not all of my structures will come together in a single day, but it’s great to have this one done. 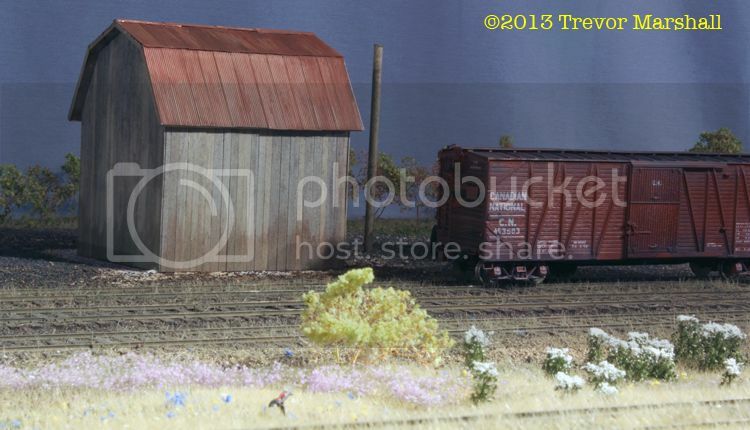 Next time I’m doing scenery I’ll work on the ground around the base of this barn. Meantime, onto another structure for Port Rowan! This entry was posted in Port Rowan - barn at team track, structures by Trevor. Bookmark the permalink. Time to paint that truck, too, I think! Nice work on a “unremarkable” structure that forms part of the Port Rowan setting. But consider yourself very lucky brush-painting the Kleenex tarp–I personally would have blown paint out an airbrush at it. I find that with thinned paint and a light touch, it flows into the kleenex quite easily. Brushing isn’t even needed, really. I’m pleased with how it worked out. Great looking barn. In the past, when making “tarpaper” for roofs, I used to food the Kleenex in half and paint it. Placed the Kleenex on a piece of foam and pinned its corners so would not wrinkle too much as the paint soaked in. After it dried I would trim it to the size needed. After seeing your tarp, I will have to give this a try for canvas tarps instead of coarse paper from the craft store. Try model airplane silkspan instead of kleenex. Easier to handle and stronger. I have only known Kleenex for use to blow my nose in, especially this last winter. However, just what do you speculate was the shed used for? What do you think might have been stored in it? Who built it? Seeing it is on track property – CN? It wasn’t the property of the farmer was it? Good questions about the shed and I wish I had a definitive answer. I’ve asked some of my contacts in Port Rowan, and the thoughts are that it was used to store hay. I don’t know whether it was hay leaving Port Rowan, or hay arriving and waiting to be distributed. It doesn’t matter, since this would’ve been before the 1950s era that I model. 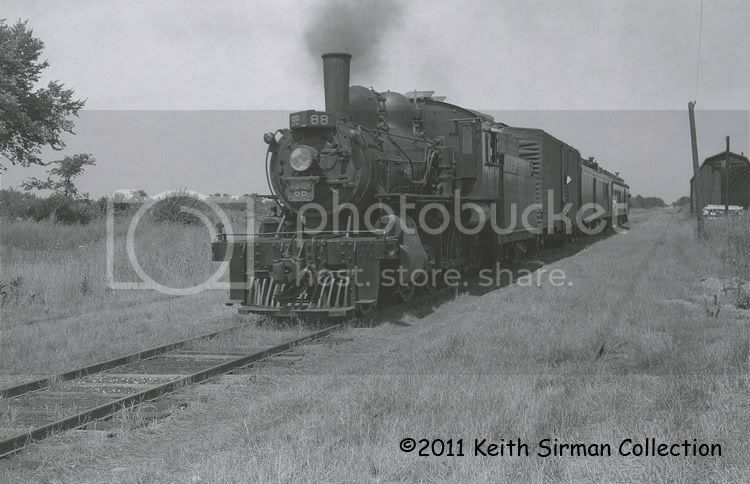 In the 1950s, I’m not sure if it was used for anything – but it sure looks neat next to the track. It’s definitely on CNR property. Nice little building. I also want to comment on the picture that showed up on the home page when I signed on today. 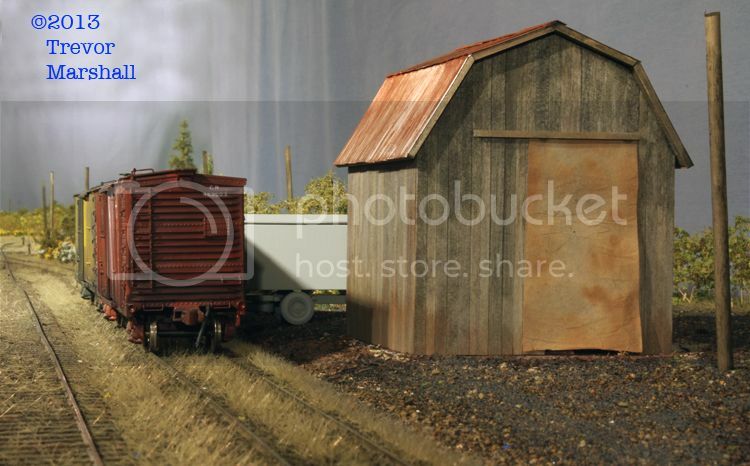 It was the picture of an engine, just leaving the orchard area with a box car on the right. It was sitting on what I think is the coal track. It was also in B&W. Just an outstanding shot! Nice work. Glad you like the structure – and thanks for the kind words about the header. I suspect the boxcar is sitting on the team track. I’ve taken a number of photos like that and they’re among my favourites on the layout. I’ve built up quite a catalogue of B&W photos for the blog header and set them to appear randomly. It’s always nice when people point out their favourites. Thanks to Mike Livingston, who has drawn my attention to a photo showing part of the other end of the barn – in a book called The 1798 Backus Mills of Long Point by Donald A. Buscombe. I’ve ordered a copy. What’s interesting about the photo is that it clearly shows a small, rectangular opening under the peak of the roof. I suspect – and Mike concurs – that this is probably a louvred vent. I will look at my original of the photo from the Keith Sirman collection to try to determine if there was a similar vent on the front face of the structure, too. Regardless, these will be easy details to add. I will build them at the bench, then stick them in place.